The Ink Trap: March Krafty Peeks at Kraftin' Kimmie Stamps: Day One! March Krafty Peeks at Kraftin' Kimmie Stamps: Day One! Welcome to day ONE of our MARCH Kraftin' Kimmie Peeks!!! Today we are excited to share a supah cute new set by artist Thais Narciso!! We'll guarantee you haven't seen anything like these adorable SLOTHS before!!! We are sharing samples today featuring.......WANNA HANG?! Then come on back tomorrow to check out MORE fun new stamps we have to share with you! And ALL the new MARCH stamps will be available on Saturday night at the KKStamps Shop!! Super cute card. Love the colouring and the layout design for this card. I love it! I love the layout, the coloring, the twine bow on top!!! EVERYTHING is perfect! *Yawn!! * What a great idea... super cute card Cheryl! Love your colouring style! 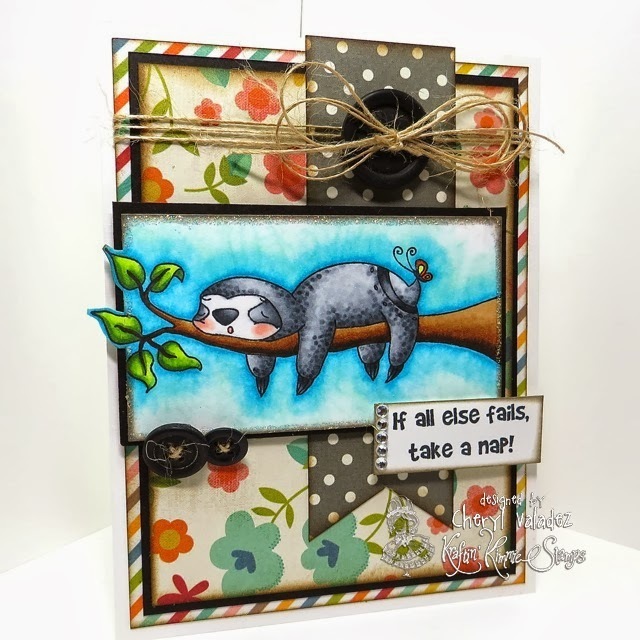 Ohhhh Cheryl...I always love your creations and this is no exception...how cute is that little sloth...oh my!! I love the texture you gave him and the colours your used...your colouring is soooo amazing. Thanks for sharing and inspiring me. I love how one stamp can be transformed intoso many different amazing cards! You ladies have done such a beautiful job of showcasing how different you can make one stamp or image!! Amazing job! I like how you do your shading technique just beautiful. A lot of work was put into this. Thank you for sharing. 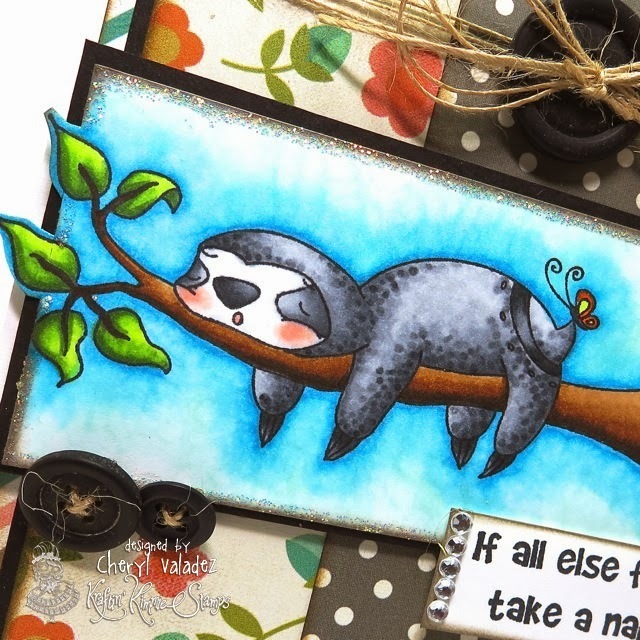 You are correct--I've never ever seen sloth stamps and I'm LOVING them!!! Your coloring is amazingness!!! I love how yours is different from the other designers--everybody is SO inspiring and you are no exception!!! You've showcased this little cutie wonderfully and thanks so much for being a part of such a fun and fabulous blog hop!!! Yep, I agree, naps can solve a lot of problems. : ) This card is adorable! Love the papers, the twine bow, the black accents and this adorable image. Oh my!! How adorable!!! That sloth is the cutest!!! Your coloring is so…wow!! Really nice card!! Fabulous card!! Love the colors of your paper & your layout with the pennant!! Cute card! I love your dotting technique coloring the sloth and how you did the sky! Great stamp set!